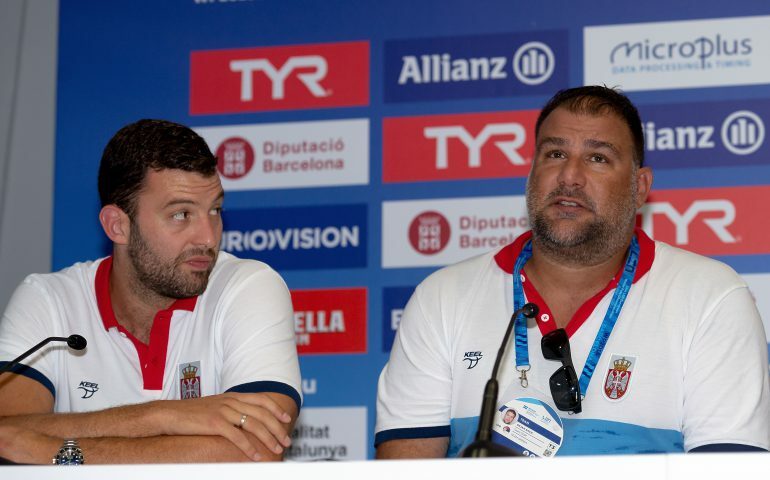 Title-holder and Olympic champion Serbia, the reigning world champion Croatia and even host Spain are aiming at the title in the men’s tournament, according to the coaches and players who talked to the press in Barcelona before the start on Sunday. The Croats’ spirits are boosted by their football team’s success, another baby arrived to the Filipovic’s family (something usual when the Serbs play in Barcelona) while the Spaniards will rely on the backing of their supporters. After two days of women’s action, the men also launch their rockets from Monday in Barcelona at the European Water Polo Championships. Before the start, representatives of the top two sides and the host team talked on their expectations. The players are also ready to go for the gold. “The key guys are mostly the same in our team so we are as strong as ever” Serbia’s captain Filip Filipovic said. “Our goal is to retain our title in Tokyo and we are in the process to achieve that. Wherever we play, we are going for the title and this time it’s not going to be different.” Filipovic added that five years ago, during the World Championships here in Barcelona, his first child was born – and something similar happened this time as he became an uncle on Saturday. “Playing in Barcelona at big events means good news in our family” the grand champion said with a broad smile. Two years ago Serbia clinched its third title in succession after beating Montenegro in the final, all in all they won 6 of the last 8 editions at the Europeans (2001, 2003, 2006, 2012, 2014, 2016). The Serbs had a unparalleled winning streak from the 2014 Europeans to the 2017 World League Super Finals, when they clinched all 9 titles on offer, including the most desired one at the Rio Olympics. Their march was halted by Croatia last summer, the Croats beat them in the semis and went on claiming the world title in Budapest. Soon they added the Europa Cup this April (beat Spain in the final in Rijeka), after they beat the Serbs in the prelims once again. The Serbs went down against Montenegro in the World League prelims thus they missed the Super Final for the first time in six years – there the title landed in Montenegro which beat Hungary in Budapest in the gold medal match.